Our friends at YouBeauty.com got the scoop on how to reverse sun damage and make skin look young again. After a summer spent exposing yourself to mega doses of sun (beach days, bike rides, brunch al fresco, anyone? ), your skin is likely feeling the brunt. Add to that the tendency to slack off on your regular skincare routine while traveling and vacationing, and it’s no surprise that the reflection looking back at you in the mirror suddenly looks a little haggard after Labor Day. Quiz: How Healthy Is Your Skin? 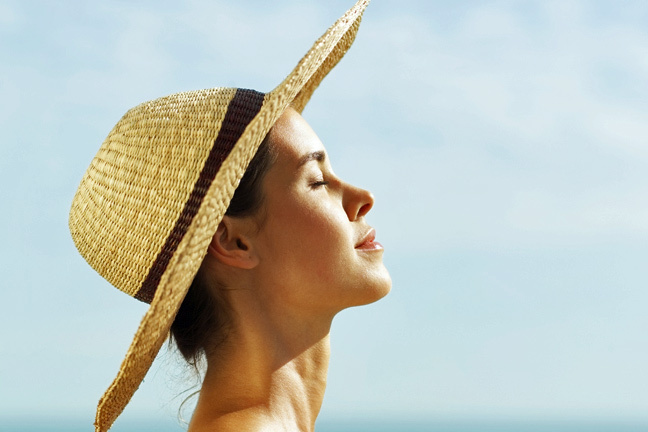 The good news is, simply reducing your sun exposure and diligently applying daily full spectrum sun protection can improve the appearance of spots by anywhere from 20 to 50 percent, though older age and greater amounts of color pigment in the skin can both act as stubborn obstacles to natural healing, says Miami Beach, Florida dermatologist Leonard Tachmes, M.D. And if you’re pregnant, on birth control pills, or olive and deeper in skin tone, the brown patches known as melasma—often referred to as the “mask of pregnancy”—can settle in and refuse to budge. Broken capillaries are another permanent symptom that lighter skin tones are more apt to see around the nose, cheeks and chin after long bouts of sun exposure. Lucky for the post-summer skin besieged, effective products and dermatology options abound, though it’s best to have realistic expectations, lest you risk sinking your money into disappointment. “Results cannot be based solely on the product itself, since every person is different,” says JoElle Lyons, personal esthetician to First Lady Michelle Obama, and esthetics director at Washington D.C.’s Hela Salon and Spa. Your results will instead depend on how committed you are to sticking to a regular skincare regime, your level of sun exposure, diet, exposure to environmental aggressors like pollution, and whether or not your lifestyle allows for optimal skin regeneration, such as regularly getting a good night’s sleep. Yet the biggest factor at play is your age, since it strongly affects the body’s ability to recover. “Results depend on cell turnover. A product can realistically work faster on a 20 year-old than on a 40 year-old,” says Lyons. If you’re interested in taking an aggressive dermatologic route, options include AHA peels, microdermabrasion, Intense Pulsated Light (IPL) laser for spots, radiofrequency treatments for skin tightening, and prescription cream Allumera to shrink pores dilated from heat, says Shamban. While in-office services combined together in a “multi-modal approach will give the most dramatic improvement and quickest results,” according to Shamban, dermatology treatments for photo aging are not covered by insurance, and can cost from the hundreds into the thousands of dollars for full series completions. There is one time when you should make it into the dermatologist’s office, and that’s if a new mole takes on any of the so-called “A, B, C, D” guidelines: asymmetry, border irregularity, color change or a diameter greater than five millimeters—all warning signs of a cancerous lesion, says Mohs skin cancer surgeon and New York dermatologist, Kenneth Mark, M.D. As they say, if in doubt, check it out. When caught early, cancerous skin cells can be removed precisely and easily enough using the Mohs Micrographic Surgery technique, and could merely be an inconvenience at most, says Mark. For more ways to treat summer fried skin, check out our gallery, which breaks down today’s leading post summer anti-aging products by skin type, with recommendations based on what will most likely work best for the unique characteristics of your skin.